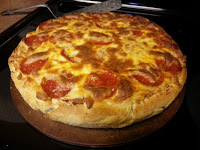 Side View of the pizza - isn't it massive? As much as I have tried I can't seem to replicate Sinaloa's Colorado Burrito for Eddie. 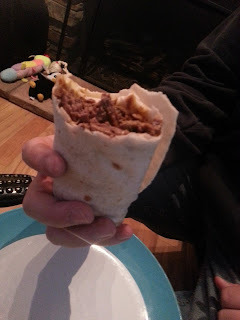 Browsing the aisles at Trader Joe's I got the idea to start with pre - marinated meat rather than just plain stew meat and while these still again weren't "Colorado Burritos" these are definitely some pretty awesome Carne Asada Burritos!! !